CAKE OF THE MONTH CLUB! We love crafting baked to order cakes and We have some fan favorites, and we are always happy to help create an original for you, recreate an old school/childhood favorite, play with a theme for a birthday or celebration and we can whip up allergen friendly cakes. We can do Vegan, Raw or Gluten-Free (we do not have a certified gluten free facility, but take the utmost care while baking). Gift a cake when you can’t be there. Send a cake to say happy birthday, thank you, feel better or just I love you! Four layers of red velvet cake filled with whipped white chocolate ganache & finished with white chocolate Swiss meringue buttercream. Four layers of vanilla cake filled & finished with a caramelized milk chocolate Swiss meringue buttercream & crunchy caramelia perles. Four layers of coconut cake filled with toasted coconut cream and finished with white chocolate Swiss meringue buttercream. 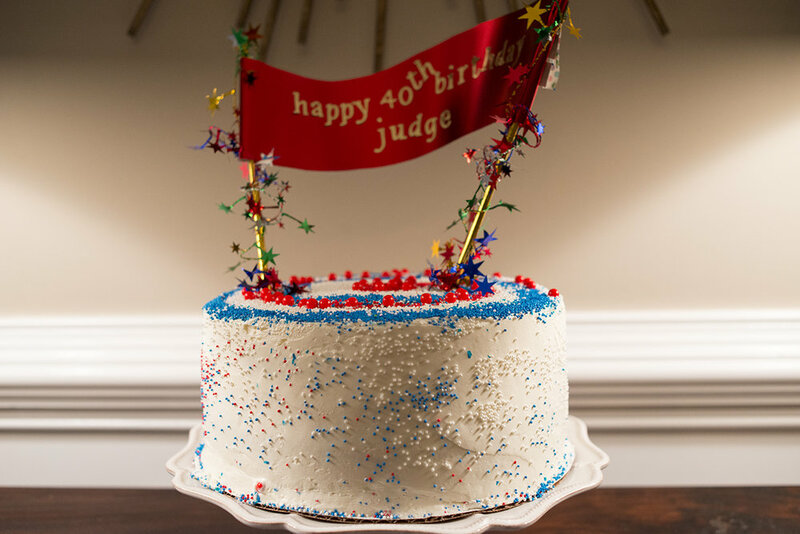 Four layers of vanilla or chocolate cake filled and finished with fudge frosting. Four layers of vanilla cake filled with citrus curd (key lime or lemon) and raspberry preserves. Four layers of vanilla cake filled and finished vanilla buttercream. Four layers of carrot cake (with or with nuts) filled with cream cheese buttercream and finished with white chocolate Swiss meringue buttercream. We offer a big selection of sweet bites and savory treats. There isn’t much we don’t make so if you don’t see it on our seasonal selections, give us a shout and let us know what your looking for. A mix of small 2-3 bite treats. Choice of 18, 21, and 24 pieces. Whether you want to send cake, or a selection of tasty treats we are happy to bake it up and deliver it to that loved one in need of some sweetness. Breakfast, luncheons, teas parties, afternoon breaks, dessert tables for weddings, birthdays and other celebrations. All catering/parties are custom designed. Must be booked with 50% deposit. Set up, break down, serving pieces and full service available. Tax and tip not included. Charged per person. Came here looking for pics? Is this website making you hungry? Let us know what we can bake for you!